For those who prefer fishing with a good buddy instead of going at it solo, the best tandem fishing kayak is for you. These water crafts are designed to hold 2 people. Often, they have space for a third. Though this is more likely to be a smaller seat. These boats are not only designed to go to your fishing spot, but also be very steady and stable so you can focus on casting and reeling. The list of products below are a summary of the items we like most from the research we’ve done. They have a lot of room for 2 individuals. Plus, extra cargo space for equipment as well as refreshments. Click here to view the top rated tandem fishing kayaks that are available on Amazon.com. The twelve foot long Malibu is a 2 person kayak. This is one of our favorite fishing boats when you want to go with a buddy. It is our best tandem fishing kayak for the money choice thanks to its balance of cost and quality. This offering from Ocean Kayak is a sit on top recreational kayak. It is built to support 375 to 425 pounds in passengers and equipment. The Malibu tandem kayak, as its name implies, has two seats designed for adults. A third seat that’s situated well in the middle of the craft, is for a child. We like that there are multiple options for feet placement for the adults. And this is thanks to the form of molded wells along the side of the kayak. What this means is that you get leg comfort and good ergonomics regardless of the kayaker’s leg length. and gear straps to restrain any equipment, fishing or otherwise, you choose to bring with you. Another water craft we like for fishing in tandem is this offering from Lifetime. The Lifetime Sport Fisher Kayak can be used by an individual or a pair. This device is a 10 foot long kayak. And it can actually accommodate up to three people contingent on their total weight combined with that of their equipment. What’s important is that the total does not surpass the 500 pound limit. The Sport Fisher is built for fishing stability. This is what makes it rank among our product reviews for this class. Its stability lets you have full control and focus on fishing without the issues of having to head with an unsteady boat. Its specially designed hull also allows users to stand or sit sideways. This helps to make casting, trolling and retrieving the catch more readily convenient when the situation calls for it. There are a total of four fishing pole holders on the sides of the kayak. The stern and bow oar holders provide a place for those items as well when they are not in use. Meanwhile, a dry compartment provides an area for equipment storage. Ditty trays and shock cords can be used for other equipment that will not be damaged if they get wet. This Lifetime Products kayak is covered by a limited one year warranty. This is another offering from Lifetime Products. The Manta is a tandem sit on top kayak. This water craft is a ten foot long boat which can carry as many as three persons at once. All in all, there are three seats available, two of which have padded backrests. Multiple slots for feet placement give options for comfort and function. There is a storage compartment in the bow of the kayak to safely secure your equipment and belongings. Meanwhile, a holder for a fishing pole and one for the oars, which are included with a purchase of the Manta, are also there for your use. Carry handles on both ends make transports and portages simple tasks. Simple, yet reliable. This kayak is specifically designed for stability which is why we like it for anyone who wants to go fishing. If you’re someone who likes having the leverage provided by standing when you’re fishing, you’ll love this boat. One reason is that the Manta is in fact, reputed to be nearly impossible to tip over even when an occupant is standing. 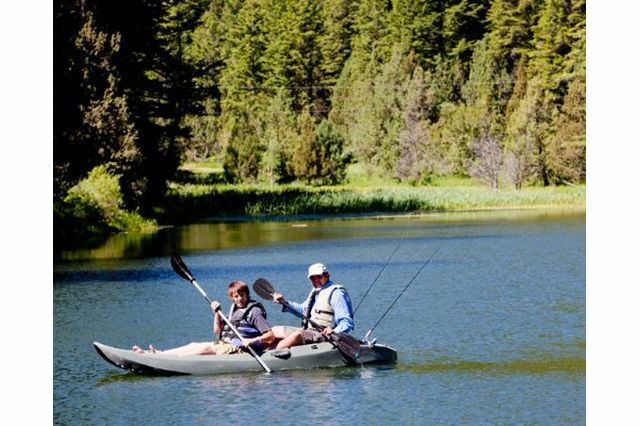 The Coleman Colorado is a two person inflatable fishing kayak. This is our top choice if you have a tight budget. It is much cheaper than most kayaks in the same class. The inflatable structure also makes transporting and carrying it around easier. The Coleman Colorado is constructed from a sturdy PVC material. It also comes with a tarpaulin bottom to greatly lessen the likelihood of it being punctured. Multiple air chambers provide an extra measure of safety. They work by assuring the Colorado will stay afloat even if a puncture does occur. The boat also comes with Coleman’s trademark Airtight system. This feature is a guarantee that simple leaks will not occur. The two seats on board are adjustable to increase the chances for comfort. Fishing rod holders are adjustable as well. There is a place for a trolling motor should you need one. The motor can also be purchased from Sevylor should you desire the need for one. Finally. a carry bag and pump are included with this kayak’s purchase. This boat can accommodate 475 pounds and may well be the best tandem fishing kayak.